Earn what you're worth as a Fastaff travel nurse. Fastaff knows that earning what you’re worth and having the time to enjoy it is important to travel nurses like you. 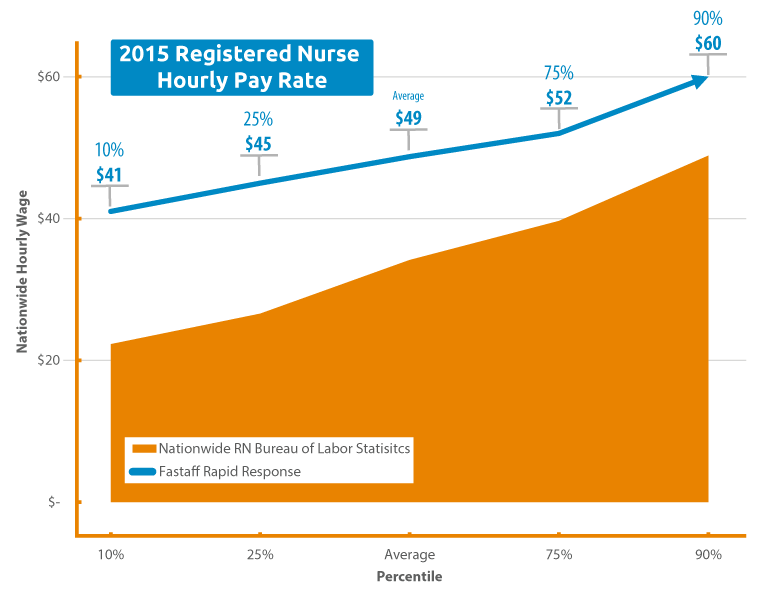 Because of this, Fastaff provides traveling nurses the highest salary in the industry. Imagine earning a salary over $100,000 a year while choosing when and for how long you want to work. Add in day-one benefits, furnished travel and housing, bonus opportunities and assignments across the country and you'll begin to understand why Fastaff is the preferred Rapid Response® travel nurse staffing agency. In fact, our top 25 travel nurses earned over $100,000 each last year (not including bonuses, nurse perks and other reimbursements), averaging just over $2,500 a week. Reach your travel nursing goals with Fastaff. You work hard to reach your goals, and Fastaff wants to help you reach your ideal travel nurse salary. Whether you prefer to work more assignments and earn a higher salary, or you want to work fewer assignments and still earn top pay, Fastaff is here to help. Travel nursing has never been more financially fulfilling. Don't take our word for it — read real testimonials from our traveling nurses. Join our elite group of traveling nurses. Call 1-800-736-8773 to speak with one of our recruiters. Better yet, complete our short online application and a Fastaff team member will review your information and contact you to discuss your options.